If you are the owner of the HTC One M9 Android smartphone, here is a good news for you. The unofficial version of CyanogenMod 12.1 is now available for the HTC One M9. All credit goes to the XDA members varun.chitre15, Rashed97 and Flinny for creating the unofficial version of CM 12.1 Android Lollipop. Most of the M9 users already tested the new ROM on their phone and happy with the new CM 12.1 and enjoying the features of the ROM on their phone. CyanogenMod 12.1 is based on the Stock version of Android 5.1.1 and comes with some decent feature which you can use in this ROM. If you are the proud owner of HTC One M9 and want to try this new ROM on your phone, here is the complete guide which you can use on your phone and install the CM 12.1 easily. To install this ROM, you need a rooted phone with TWRP recovery. Check out this guide to root and flash custom recovery on HTC one M9. This guide is only for the HTC One M9 android smartphone users and don’t try this method on any of other android phones, otherwise you will brick your phone. Do take the full backup of your phone before following this guide. NOTE:- Your warranty is void if you follow the given instruction in this guide. We or the developers are not responsible for bricked devices, dead SD cards. Read all the instruction very carefully and Perform everything at your own risk. Step 1. As we mention above to flash this ROM you need a rooted phone with Custom recovery. Step 2. 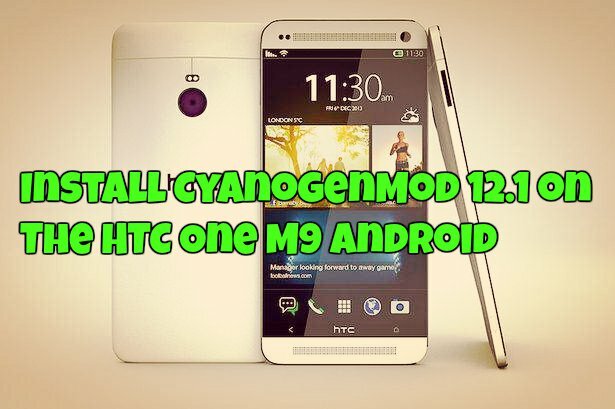 Download the CM 12.1 ROM for HTC one M9 here and save the zip file on your desktop. Step 3. Download the Google Apps flashable zip for the phone here and save it on your desktop. Do not extract the zip folder. Step 4. Once both files are downloaded. Copy the ROM and GApps zip file to your phone. Step 5. Now boot your phone in recovery mode. Step 6. Once your Phone in custom recovery mode. Wipe system partition, cache, data (factory reset) from the recovery. Step 7. After this Install the ROM zip file on your phone. Step 8. Now install the Google Apps flashable zip on your phone. Step 9. Once the zip file are installed on your phone, go back to the recovery main menu and Reboot System. First boot will take some time and now your phone is running on the CM12.1 Android 5.1.1 lollipop.